Marvel’s The Defenders follows Matt Murdock/Daredevil (Charlie Cox), Jessica Jones (Kristyn Ritter), Luke Cage (Mike Colter),and Danny Ran/Iron Fist (Finn Jones), a quartet of singular heroes with one common goal – to save New York City. This is the story of four solitary figures, burdened with their own personal challenges, who realize they just might be stronger when teamed together. We got a chance to chat with some of the cast at the San Diego Comic-Con, including Cox, Colter, Rand, Elodie Yung (Elektra) Jessica Henwich (Colleen Wing), Sigourney Weaver (Alexandra) and writer Marco Ramirez. He also told us about finding a tone for four very different characters and allowing them to mesh. He said, “I think what we knew we didn’t want to make it feel like everyone was visiting Jessica Jones’ world or everyone was visiting Matt Murdoch’s world. We needed to make this a standalone thing, with elements borrowed from each of the other worlds.” He also said it was important to make the characters recognize that this is the next big chapter in their lives on their own before they had them meet. Weaver talked about stepping into the Marvel world. “You know, I’d heard of the shows, and I’d heard that they were marvelous with wonderful actors, but I didn’t know them as a New Yorker. There’s so much that it’s hard to keep track. I loved Daredevil and Jessica Jones. I thought they were both wonderful, great acting, wonderful writing. Really, New York is a character in these shows. And I think that continues through Luke Cage and Iron Fist. They approached me about creating a new character. I was excited because, often when they create a new character, an older woman, you know, you’re having to deal with people who — they have an idea that they’re an ice queen or something like that. I just think we all wanted her to be a very believable person in New York, who had a real New York life. Something of a kingdom in New York… unfortunately these four young people who are so idealistic, we don’t have the same priorities. Otherwise I think that she could easily bring them into her organization and mentor them. They’re obviously very talented, but it’s that pesky idealism that they have that complicates things for her.” She said that Alexandra is a business woman and that she’s based on real people she knows. Cox told us that his relationship with Jessica Jones is adversarial in the beginning. He said that someone like her dealing with someone who “wears a red pants suit” is entertaining, but that he loves the scenes where they come to respect each other. He also said the fact that he’s the only one with a secret identity was definitely an issue for him. The series follows the releases of Marvel’s Daredevil, Marvel’s Jessica Jones, Marvel’s Luke Cage and Marvel’s Iron Fist. Marvel’s The Defenders stars Charlie Cox (Matt Murdock/Daredevil), Krysten Ritter (Jessica Jones), Mike Colter (Luke Cage) and Finn Jones (Danny Rand/Iron Fist). 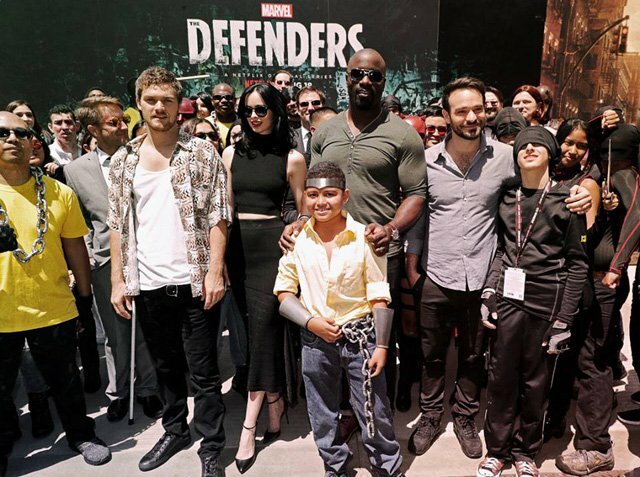 Additional cast members include Academy-Award nominated actress Sigourney Weaver (Alexandra), Elodie Yung (Elektra), Scott Glenn (Stick), Deborah Ann Woll (Karen Page), Elden Henson (Foggy Nelson), Carrie-Anne Moss (Jeri Hogarth), Rachael Taylor (Trish Walker), Eka Darville (Malcolm Ducasse), Simone Missick (Misty Knight) and Jessica Henwick (Colleen Wing). Marvel’s The Defenders premieres globally on Netflix on August 18, 2017 at 12:01am PT. We want to hear from you! Leave us your comments below or tweet us @ComingSoonnet, and stay tuned for more news from San Diego Comic-Con 2017!